This is kind of what's going on in my mouth right now. Yesterday I had an oral surgery. FYI, they are no fun. Well, the Valium was okay and made the experience a whole lot more enjoyable, but the aftermath is no fun at all. So let me explain the story. When I was in 6th grade my dentist/orthodontist pulled four of my baby teeth to make room for the adult teeth. Three of my teeth grew in. One did not. Three years passed and I pretty much sat around doing nothing. I was a freshman in high school when she approached my mom and said, "I have no idea what is wrong. You're going to need to see someone else." All I had to say was, "Hey, thanks for wasting the last two years of my life and charging my mom an arm and a leg for it." We went to a consultation with a new orthodontist, a better orthodontist. One with TV's attached to the ceiling. At the consultation he noticed, through an x-ray, that my tooth was headed in the wrong direction, thus why it never came down. Solution? Easy. I went in for an oral surgery where they cut open my gum and glued a bracket connected to a chain to my impacted incisor. The chain was attached to my braces. 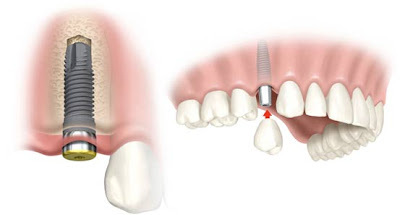 The procedure would drag the impacted tooth down to where in belonged. In the massive gap in my mouth. Problem: Nay! Question: What happens when you pull a tooth and don't do anything for two years to pull the correct tooth into place? Answer: The tooth that never grew in spent three years in the wrong place and thus grew into my jawbone. Consequence? Well, because my tooth had grown into my jawbone, instead of being pulled down by the braces, all my teeth attached to my braces were pulled up... a lot. So my teeth were incredibly uneven. A little bit of braces and rubberbanding my teeth together helped the situation, but to this day I don't chew with the left side of my mouth because my molars don't touch back there. Then what? Well, we had to cut the chain attached to my braces and impacted tooth. Fast forward to my senior year of high school. I get my braces off but I am still missing a tooth. That's a bummer, but I had a retainer with a tooth in it, so nobody really knew. I got my wisdom teeth pulled. That was a nice little oral surgery. When they pulled my wisdom teeth we needed them to pull the other tooth hidden in my gums with some bling bling still attached to it. Fast forward to yesterday. After a long time of saving I had my (hopefully final) oral surgery. The process involved them cutting my gum in two places so they could flap it up to carve a spot for a titanium rod. I've never had a tooth there before, so I didn't really have any bone there. A little bit of a bone graft and some more slicing and dicing and I was out. Unfortunately for me, I am in a lot of pain, but on the bright side, I'm only four to five months away from a tooth. I just have to suffer through a lot of stitched and an open wound in my mouth for a little while. Thanks for making my oral experience worse than anything I've ever experienced and the most expensive. I appreciate it, but I don't plan on suing you, even though I would probably win.